The best books are those which you discover by word of mouth. My friend Freya read 'The City & The City'. You could hear the fascination in her voice as she discussed it. I added it to my Amazon wish list. Fast forward a few weeks and I returned home to find a parcel waiting. It was 'The City & The City' sent as a gift from Freya. I was in the middle of reading something else, but I flicked to the first page and began reading. And reading. And reading. It's not a book that's easy to put down again. Then it was over and I could hear the fascination in my own voice, as I recommended it to all around me. 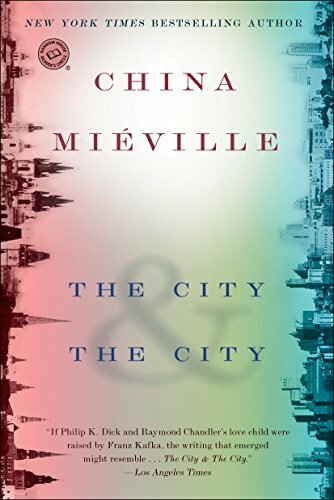 China Miéville pulled off something here, unlike anything I ever read before. This is a story which forces you to look up from the page and peer very intently at your own world. Partway through reading The City & The City, I went outside. My street is made up of terraced houses, punctuated here and there by semi-detached dwellings. I attempted not to see every other house. I wasn't very successful at it. Which is a pity, because if I lived in Ul Qoma or Beszél, I would Breach. Shadowy figures would emerge from the cityscape all around me. I would be seized and never seen again. There is no crime more heinous, more subject to universal disdain than Breach. Geographically, foreigners would be forgiven for thinking that the two cities were just one. They sit right on top of each other. Walk down any street and that building is in Beszél, this other in Ul Qoma. An independent observer might swear that two people strolled in close proximity, but they would both tell you that they were alone. They were each in their own city state. A murder could be committed in, say, Beszél and a crowd of people in Ul Qoma would look away. Intervening would be a greater crime than the slaughter itself. They would not see it, because they were raised from childhood not to see it. This isn't a story about parallel dimensions existing in separate planes of existence. It's about two countries, which just happen to occupy the same broad terrain. Someone from Ul Qoma could easily enter Beszél, as long as they took their passport and entered through the appropriate border control. So when the body of an unknown woman appears in a park in Beszél, the assumption is that she was killed in Beszél. It turns out to be a murder case like no other investigated in either the city or the city. Without the bizarreness of Beszél and Ul Qoma, The City & The City would play out as an engaging crime novel. It's intelligently done. As I turned each page, following the clues along with Inspector Tyador Borlú, I was constantly revising what I thought was going on. Usually books like this bore me, because I've worked out the ending early on. I'm just waiting for the characters to catch up and enact the big reveal. Not so this novel. Borlú and I worked things out at the same time. He was both my guide through this strange world, and my representative within it. Which meant that he did his job very well. The dead woman is covered in make-up and she was found close to a red light district. The preliminary investigation naturally factored in that she may be a prostitute. That was what the investigators were meant to believe. The whole set up shatters under close scrutiny. The picture which takes its place is even more sordid. It involves conspiracies, corruption and the ever present threat of Breach. It's a roller-coaster journey, which will keep you turning the page long after you've accepted the reality of the city and the city. And what realities they are! The deeper into the novel that you go, the more details about the two city states are revealed. Most are cast as casual comments or passing observations, yet they enrich the scene so much. I spent a good five minutes musing on how a war may be staged between these cities, after Borlú mentioned that there had been two. Did they go elsewhere to do it? Or fight over the border line in Copula Hall? They couldn't fight in the streets for fear of Breach. They wouldn't even be allowed to see the enemy combatants, nor fire a shot into their neighbor's terrain. Even doing so randomly would invoke the appearance of a higher power. It's questions like this, prompted by irrelevant throwaway minutiae, which elevate this tale from detective story plus unusual setting. It becomes something much more, in which the names of Orwell and Kafka are all too easily evoked as examples of the genre. 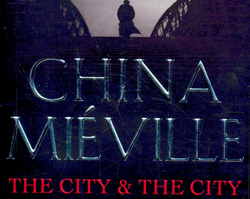 China Miéville himself has won the Arthur C Clarke Award three times. He's also netted the British Fantasy award twice. Those trophies can nestle in his cabinet alongside a Hugo, World Fantasy and a BSFA Award. This particular book has topped best selling lists in various newspapers and sites, including the Amazon Best of the Month title for June 2009. If you haven't read it yet, then I can't recommend it enough. Now please excuse me. I have to rush and discuss this with Freya! This version has been translated into German by Eva Bauche-Eppers. This version has been translated into Spanish by Silvia Schettin Pérez. I can thoroughly recommend this one. I've been away for the weekend and I've been telling all of the friends that I was visiting to read this too. I'm well up for exploring more by him. You're welcome and thank you for commenting. Oooh, I haven't read this one. He is really such a fabulous author - unique mind - and I'd be hard-pressed to pick which one (of the ones I've read) I like the best. Thanks for the review! Excellent, thank you. I'll put them all on the list to check out. Hi Jo, I think the best place to start is Perdido Street Station, the book that really made him famous. He has two other books set in the same universe - The Scar and Iron Council - but they are standalone rather than a trilogy. Oh! Could you recommend any others? This is the first of his books that I've read. I'd be very willing to explore more though. China is one of my favourite authors, and this is an excellent book.